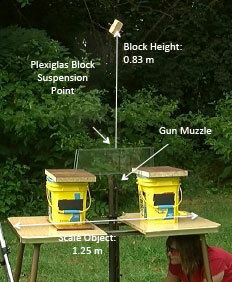 This vignette shows that when a suspended block of wood is shot from below with a .22 rifle bullet, the bullet embeds in the block which then rises straight up to a distance of just under a meter. This is not surprising. What is surprising is that if a block is shot off-center and given a noticeable amount of rotational energy it still rises to the same height as in the previous example. This phenomenon is not obvious to students and most instructors. Careful analysis shows that the block behaves according to the laws of physics. Co-produced with Derek Muller, the creator of the popular Veritasium YouTube channel. A homework assignment and recitation tutorial have been developed to accompany this vignette. To download a ZIP file containing them, right-click on the following link and choose "Save Link As...": IVV-Bullet-Block-Assignments.zip It may un-ZIP automatically when you download it, or you may need to use an application to un-ZIP it. This is a great way to help us see a visual to better understand the material! Thank you! Once again, this was a really good way to get me actively learning the material. The videos were interesting and the concepts presented were clear. No suggestions needed. Thanks for the help! The video was really helpful in understanding how the experiment works. Physics Works!